Fall is such a magical time to get married; with the changing leaves creating beautiful natural backdrops, the cooler weather giving more options with your attire, and an overall festive mood in the air. It's no surprise that fall is emerging as a top wedding season. Here, check out 50 wedding details that will elevate your autumn nuptials. A rustic ladder, brightly-colored mums, a lantern, and bales of hay set the scene for this autumn wedding. 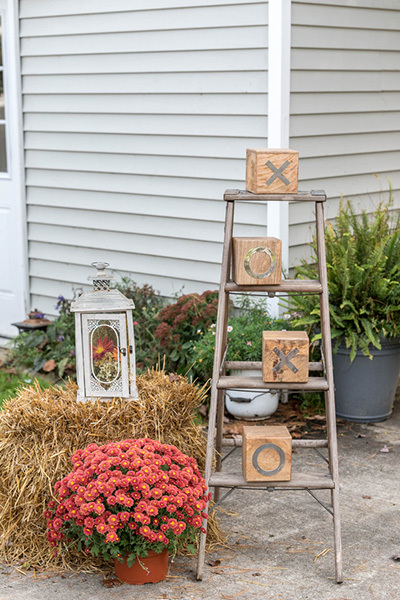 Point the way to your wedding with a rustic sign — accented by hay, mums, and pumpkins for fall, of course. Your tent's support poles don't have to be unsightly — dress them up harvest-style with corn stalks, mums, hay, and gourds. Make your welcome sign stand out by surrounding it with mums in autumnal shades. Take your carved pumpkin up a notch with a silhouette of you and your new spouse. A grapevine wreath accented by rich flowers perfectly sets the tone for a fall wedding. Use a wagon to display your wedding flowers and a sweet sign. Carry your flowers inside a pumpkin basket. Rich hues in autumnal shades make up this beautiful bouquet. Instead of a traditional bouquet, have your bridesmaids carry grapevine wreaths accented by soft florals. Balance soft pink with deep autumnal hues, accented by succulents. Let your bridesmaids sparkle and shine in sequined gowns. Soft neutrals allow your décor elements — like pumpkins — to really pop. Wrap yourself in an blanket or oversized scarf to keep warm. Skip the black tux in favor of something more fun (and perfect for the season!). Having an outdoor ceremony? Gather some blanket scarves for your guests to use if they get cold. Give your ceremony programs a rustic touch with a woodgrain print. Cover your aisle in petals that reflect the falling leaves. Dress up your aisle with colorful mason jars on tree stumps, accented by baby's breath. Painted pumpkins make the perfect ceremony aisle décor. A clearing in the woods creates such a romantic natural setting for your wedding, especially during the fall. Accent a branch archway with a garland of soft flowers. Seat your guests on logs during your outdoor ceremony for a sweet rustic vibe. Accent your table runner with hidden pumpkins and gourds. Red, orange, and yellow flowers scream fall, especially when paired with tree slices and pumpkin table numbers. Dining by candlelight is always a chic option. Surround a lantern with autumnal flowers for a fall vibe. Modern woodgrain vases play beautifully against autumnal flowers. Keep it simple and pretty with pinecones, lace, cotton, and mason jars. Enjoy the taste of fall with a pumpkin spice bundt cake. On a chilly fall night, roasting marshmallows around a fire is a delicious way to keep warm. Perfect for early fall, an apple cider slushee is refreshing while still being seasonally appropriate. A coffee bar is always a welcoming option. Mulled apple cider is a warm treat your guests will love. Add some fun to your cocktail hour with seasonal games, like pumpkin tic-tac-toe. Transform bales of hay into a casual couch for guests to relax. Dress up your sweetheart chairs in style with monogrammed plaid. Adorn each place setting with a fabric pumpkin. Bring the outdoors in with a branch motif projected on the walls. Bare wood tables and chairs reflect the great outdoors. Accent a rustic wedding sign with a garland and pumpkins. Keep your rings safe inside a carved wooden box. Make your wedding cake a true standout with a carved wood cake stand. Reflect your fall theme with a leaf motif wedding guest book. Have some fun with your wedding photos by incorporating jack-o'-lanterns. Take advantage of the beautiful natural scenery fall creates. Dress up the background of your pictures with mums and corn stalks. Create a DIY "falling in love" photo booth for your guests to enjoy. Sandwich your rings between two mini pumpkins for a quintessential fall wedding photo. Let love grow with succulent wedding favors. Send your guests home with a classic fall favorite treat.